Täiuslik esimene soojatott vankrisse või turvahälli - Voksi Move . Voksi Move soojakott sobib enamus lapsevankritele ja jalutuskärudele. Nutikad avad tagaküljel muudavad vankrikoti paigaldamise kiireks ja lihtsaks ka turvahällis kasutamisel. Voksi Move arendamisel püstitati eesmärgiks pakkuda head lahendust liikuvale vanemale ja lapsele, tagades turvalisuse ning meeles pidades ka mugavust ja soojust. Voojakoti seljaosas on vill (aitab niiskust hoida lapse kehast eemal), pealmine osa suled, sisemine vooder – 100% puuvill. The Voksi® Move fits most baby car seats and strollers. Smart openings in the back make the stroller bag easy to adjust based on your infant carrier. When developing the Voksi® Move, our goal was to provide frequently travelling parents with a solution that keeps their child comfortable and warm in the baby car seat, while not restricting your child’s safety in its car seat. By featuring back openings and pre-cut holes in different heights for the internal harness, the Voksi® Move enables you to place the car seat’s internal harness in its correct position without adding a thick extra layer between your child and the harness. Additionally, by being close to the body, Voksi® Move is the perfect first stroller bag to protect your small and fragile baby during the cold months their first year of life. To provide your child with warmth and the highest comfort, the material combination of wool, down, feathers and soft cotton keeps your child warm during cold days. The wool filling in the bottom part has the unique ability to transport moisture away from the baby’s body while keeping a stable and comfortable temperature. 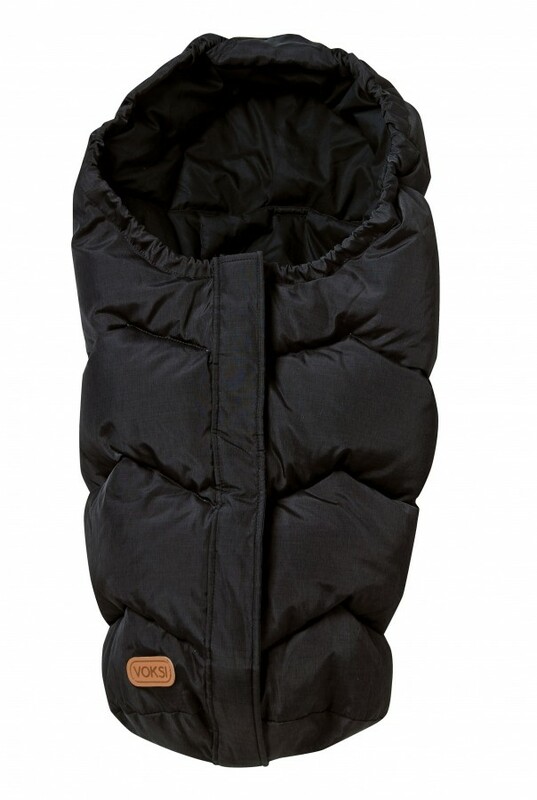 The down/feather-filled top part creates a cosy, warm and lightweight protection for your child. Not only is it made of high-quality materials, the Voksi® Move also features an easy way of zipping the footmuff open, so that you can quickly adjust the Voksi® Move to the temperature conditions and your child’s preferences. The openings on the backside make fitting the car seat’s or stroller’s internal harness easy and pre-cut holes in different heights allow you to use the Voksi® Move during the whole usage period of your child car seat. When using the footmuff in a stroller, anti-slip material on the back makes sure that it stays in place during the whole time. A pacifier holder badge near the head opening helps you to always keep your child’s pacifier in reach by attaching a pacifier holder to it. All materials of the Voksi® Move are certified according to the Oeko-Tex Standard 100, Class 1. Oeko-Tex is an independent testing and certification system for textiles, intermediate and end products at all stages of production. By choosing a product made of Oeko-Tex certified materials, you as a parent can be sure that your baby is surrounded by materials free from hazardous substances or harmful chemicals.